The Cardiff segment of the regional Coastal Rail Trail (the Cardiff Rail Trail) will be located along the railroad tracks between Chesterfield Drive and Santa Fe Drive, detouring inland from Rte. 101 so that it is integrated with the community rather than being stranded outside Cardiff. The plan for the Cardiff Rail Trail is described below, section by section. A separate SANDAG project provides for improvements to the Chesterfield/101 intersection, including a pedestrian and bike friendly crossing over Rte. 101 and the railroad tracks which will lead to the start of the Cardiff Rail Trail. This crossing will bring the Coastal Rail Trail into the community of Cardiff. The mixed-use trail will include paved bike lanes and a natural surface for walking and running. A four foot post and cable fence will separate the trail from the tracks (at the insistence of NCTD, or North County Transit District, who owns the railroad right-of-way and plans to fence off the entire rail corridor over the coming years). The trail will wind through the natural environment between Chesterfield and Verdi, with improved accessibility allowing many more people to enjoy that area. 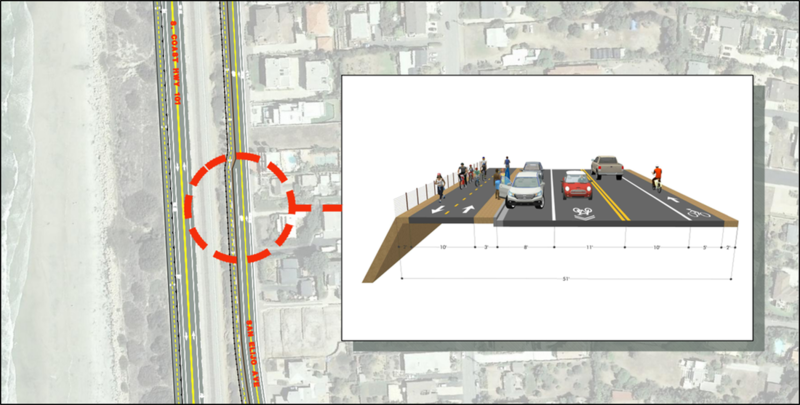 To address the critical community need for beach access, the Encinitas City Council has approved $1.7 Million in funding for the design of a pedestrian undercrossing at Montgomery or Verdi Avenue, which will be accompanied by a traffic light and crossing on Coast Highway. The rail trail will connect this new crossing to the other crossings at Santa Fe and Chesterfield, creating a network of trails and crossings that make it easier for residents to get to the beach without taking their lives in their hands. A pedestrian activated traffic light will be added to Route 101 as part of the crossing project. The current unimproved dirt parking lot on the shoulder of north San Elijo Avenue will be replaced by the new trail along with a new parallel parking lane (with the trail separated from the road and the parking lane). Retaining walls will be built along some stretches of San Elijo to halt erosion which is continuing to shrink the bluff top every year. 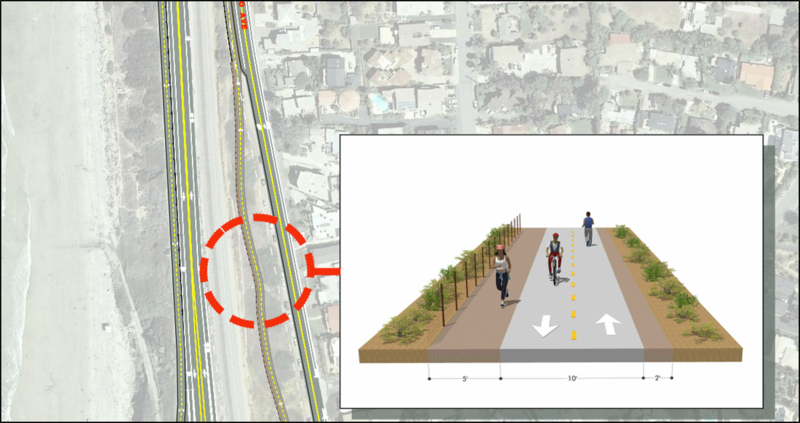 ​The combination of the trail and the new parallel parking lane will eliminate serious pedestrian and bike safety issues that plague this part of San Elijo Avenue. Pedestrians and riders are often forced to detour into speeding traffic to get around vehicles parked at 90 degrees or at a slant. The $6MM underpass at Santa Fe Drive built in 2013 includes a traffic light and pedestrian crossing to the other side of Route 101 and provides a gateway from the new rail trail to Swami's Beach and downtown Encinitas. 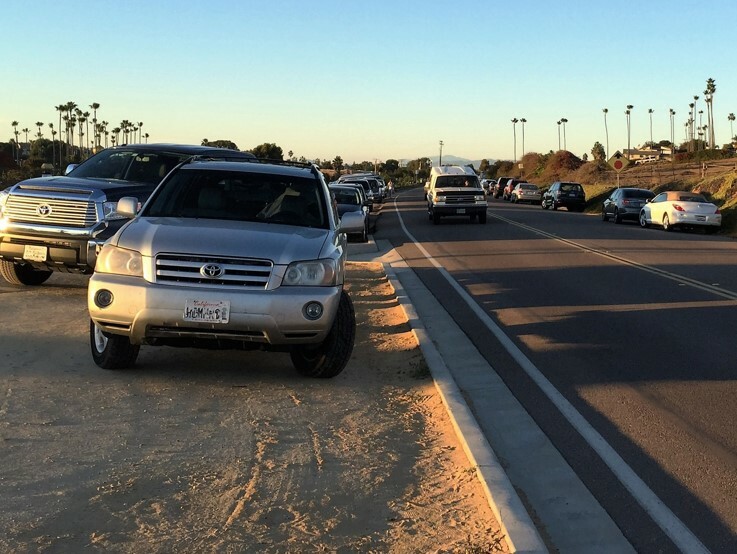 Access to the underpass from the south is currently hindered by chokepoints on San Elijo Avenue where parked cars on the unimproved road shoulder often obstruct pedestrians and riders. The planned trail will solve this problem and open up the corridor to the south. 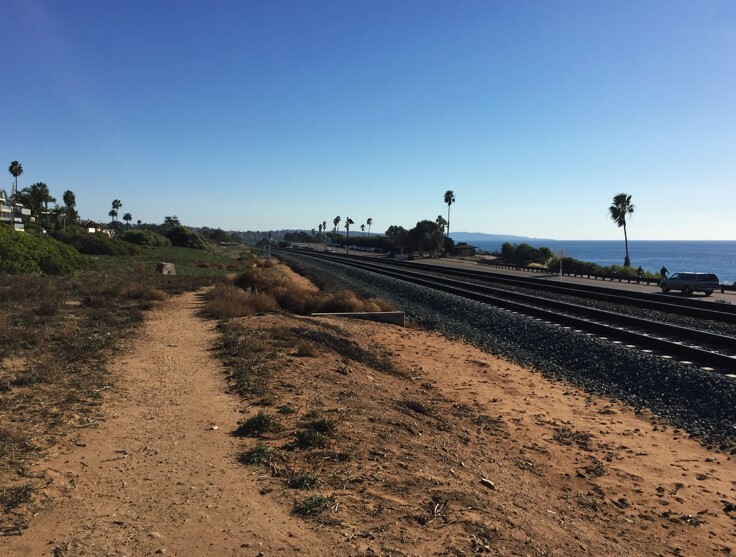 It's worth noting that Santa Fe Drive (running east to west) is also a well traveled pedestrian and bike corridor, so a new accessible connection to the rail trail will also open up Cardiff to other parts of Encinitas including the Highlands. The plan calls for bike lanes on Vulcan between Santa Fe and E Street. Pedestrian traffic flowing north would use the Santa Fe underpass to reach the sidewalks on both sides of Rte 101 and travel into downtown Encinitas. 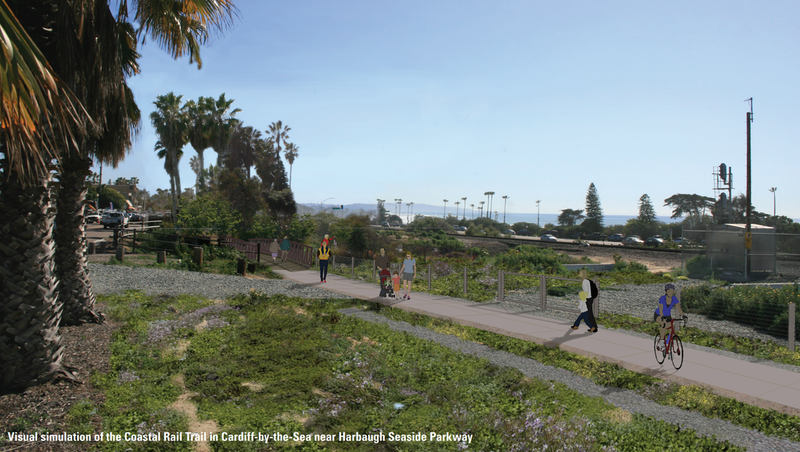 Alternately, pedestrians could walk along the natural trail just east of the railroad tracks from Santa Fe to E Street (which is more accessible and pedestrian friendly than the road shoulder of San Elijo Ave to the south between Santa Fe and Montgomery). In a perfect world the fully improved trail would extend from Santa Fe to E Street.